I'm a regular contributor to the Oracle APEX forum and something I'd like to note is the amount of questions that possibly wouldn't need to be asked if one had consulted the help of the attribute in question. For example, here someone asked about referencing page values in the Email built-in process. I managed to interpret the question two different ways on reading it twice, so I would also plead with people asking questions to supply code. If you've ever asked a question at AskTom you might appreciate the value of a good test case in providing context, and the ability for someone willing to help out to quickly investigate the problem. APEX questions can be a little harder since often you can't just provide a set of SQL commands. This is where supplying an image can truly paint a thousand words. If I had even just the middle section of this screenshot from APEX, I would have known exactly how to answer the question. The same type of help is also available in 4.x by clicking the attribute label. And if you're still using the Component View in APEX 5 it will be in the same place, but I recommend you give the Page Designer a go - I find it far more productive with far less clicks and jumping between pages. 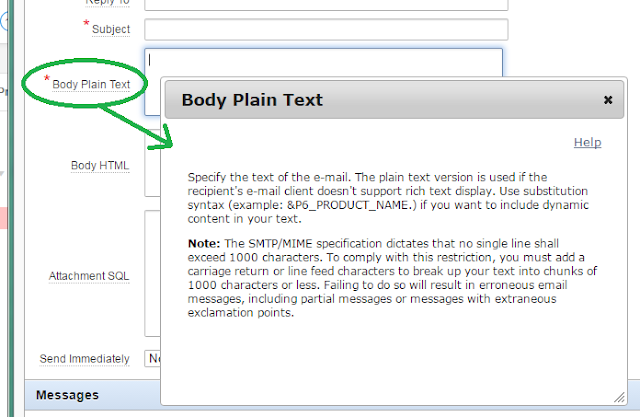 So next time you have trouble figuring something out, check out the inline help. While the help descriptions have improved in APEX 5.0, the feedback option is still "Coming soon", so perhaps this will be made available during the 5.1 release. At least we had another outcome of this question, Jeff learned about a type of process he wasn't familiar with ;p.